Do you ever worry about cash flow? Are slow payers giving you the run around? Is chasing last month’s debtors distracting from this month’s growth? As you probably know, many businesses that offer credit terms find that not all their clients will actually pay them on time. It’s even possible to end up feeling like you are acting like a bank for some of your clients. Does that sound familiar? If you would prefer spending your time at work growing your business, rather than chasing payment of old invoices – we can help. We work closely with a firm called smartAR who promise to help your business get paid faster. To achieve this they use a unique combination of data, expert people and a ledger management process customized to your business. 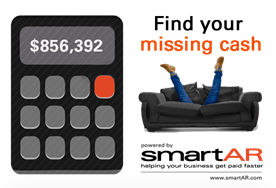 smartAR actually GUARANTEE that if your business uses smartAR you will enjoy having more CASH in the bank, fewer debtors and a whole heap of new time to focus on your main business priorities. Please contact us directly to discuss this option if it sounds interesting or simply check out the smartAR website.